The Champions in this category are organizations or individuals that have played an instrumental role in attracting talent to a manufacturing company or the industry (more detailed Champions features can be found in the 2018 Champions Yearbook). 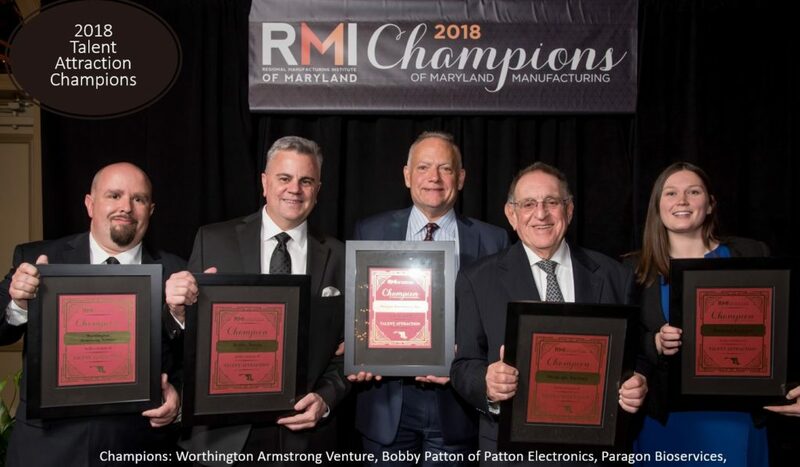 Montgomery County’s Bobby Patton, CEO, Patton Electronics, a communications equipment manufacturer, is exemplary in volunteer services to expand the manufacturing economy and encourage careers in advanced manufacturing. Baltimore City’s Paragon Bioservices’ delivered more than 80 percent revenue growth in 2017. Within three years, Paragon’s workforce grew from 100 to over 300 employees, becoming one of the fastest growing biotechnology companies in Maryland. Baltimore County’s Strategic Factory plays an ongoing and active role in attracting new talent to the print manufacturing community, starting with just two employees in 1999. The company now consists of more than 150 team members. Baltimore County’s Textron Systems begins molding high-potential talent before they leave the classroom, offering internship and co-op experiences across integrated supply chain, information technology, finance and engineering disciplines. Harford County’s WAVE implemented an in-house training program for Tool and Die Makers and Maintenance and provided guidance on training needed in the industry for new hires and incumbent workers.